“No” (2012). Cast: Gael García Bernal, Alfredo Castro, Luis Gnecco, Néstor Cantillana, Antónia Zegers, Marcial Tagle, Pascal Montero, Jaime Vadell, Elsa Poblete. Director: Pablo Larraín. Screenplay: Pedro Peirano. Play: El Plebiscito (The Referendum), by Antonio Skármeta. Web site. Trailer. In 1973, Chilean President Salvador Allende and his Communist/Socialist coalition government were overthrown by a military-led, U.S.-backed coup. Allende’s commander-in-chief, General Augusto Pinochet, assumed the presidency, holding on to that post for 15 years. During his time in power, Chile experienced an economic turnaround, eliminating much of the poverty it had once suffered. However, such prosperity came at a high price; to maintain control, Pinochet and his authoritarian regime ruled with an iron fist, resorting to torturing, murdering, beheading, exiling and “disappearing” those who opposed the dictator and his autocratic cronies. But, by 1988, as word of Chile’s human rights violations had spread across the globe, increased international pressure was placed on the despot to clean up his act. Pinochet’s solution was to call for a plebiscite on the country’s political future. A “Yes” vote would guarantee the dictator another eight years in office, while a “No” vote would signal a call for open elections. The campaign period for the referendum was to last only 27 days, with each side limited to a scant 15 minutes of televised promotion time per day. Opportunities to persuade voters to reject the incumbent power structure were thus extremely restricted. Many of Chile’s “dissidents” believed the plebiscite was rigged from the outset, that their voices of opposition, even if heard, wouldn’t change an outcome that they saw as a foregone conclusion. Those who weren’t quite so disheartened believed an honest vote truly was possible, but they feared that many of Chile’s voters had either become complacent (lulled to sleep by the country’s newfound economic abundance) or felt intimidated (deathly afraid of retribution from Pinochet’s secret police, the DINA). If the No campaign was to have any hope for success, its backers knew they would have to implement a promotional strategy that would effectively snare voter attention. As the promotion period ramped up, José Tomás Urrutia (Luis Gnecco), one of the leaders of the No contingent, called upon René Saavedra (Gael García Bernal), a hotshot ad agency “closer” (one who seals deals with clients), to take a look at what his colleagues were proposing. René, a soft-spoken, smooth-talking, supremely confident professional adept at selling clients and consumers alike on advertising programs for everything from soda pop to microwave ovens, was initially asked just to offer an opinion on the proposed campaign. But, before long, René became committed to the No coalition’s efforts. Having been personally affected by Pinochet’s atrocities (his father was one of the disappeared, and his activist ex-wife, Verónica (Antónia Zegers), was routinely harassed and arrested by authorities), he couldn’t help but embrace the opposition’s crusade. The powers-that-be initially scoffed at such efforts, seeing them as silly and frivolous. But that all began to change when it became apparent that René’s unlikely approach was working. In fact, René’s success drew considerable, and sometimes-unwanted, scrutiny, such as from his boss, Lucho Guzmán (Alfredo Castro), a supporter of the Yes campaign. It even captured the attention of Minister Fernández (Jaime Vadell), who, like Guzmán, served as a trusted advisor to Pinochet. Before long, René and his peers also became the subject of government-backed surveillance and intimidation, including veiled threats made against René’s young son, Simón (Pascal Montero). And, as the campaign wrapped up, official efforts to squelch public support for the No intensified, resulting in violent crackdowns at organized rallies in favor of the cause. But, come election day, the voters had a hearty last laugh – and all at Pinochet’s expense. Whenever someone challenges the conventional wisdom, it’s easy to dismiss their thinking out of hand. So it was with René’s proposed plan. Selling a political concept like a consumer product made his strategy an easy target for cynical, close-minded pundits. After all, who could possibly take seriously a proposal for a country’s political future when it’s pitched using the kind of happy talk marketing techniques typically reserved for plugging a breakfast cereal? But, as the detractors found out, those who easily dismiss out-of-the-box efforts like this run the risk of underestimating the inherent power of ideas, especially those that have never been tried before. Virtually anyone who is genuinely passionate about a particular goal has an unshakable faith in the outcome of the effort aimed at fulfilling that objective. An ardent devotee sincerely believes in its inevitability, thoroughly convinced of its ultimate manifestation. Such is the essence of effective conscious creation – the practice of employing beliefs to materialize the reality we experience (preferably in line with the vision we would hope to achieve for it). So it was with René, whose unwavering confidence and resolute belief in his approach helped catapult his strategy to success. He knew his plan would succeed, and so it did. So how did René know his plan would work? For starters, he trusted his intuition, one of the tools conscious creators routinely employ in working their magic. Indeed, he was well aware of his proposal’s intrinsic viability. But this inner knowledge wasn’t based on sheer random conjecture; he understood why it would work and, accordingly, fostered beliefs to support such prescience. For instance, René successfully tapped into the underlying mindset of Chile’s voters at the time, even if that prevalent attitude went largely unspoken publicly. He knew that, if the No campaign were to prevail, he would have to bring that suppressed outlook “aboveground,” raising it from the depths of the nation’s repressed consciousness to the light of day, thereby making it visible for all to see – and accessible for everyone to embrace. To that end, he knew that the population had tired of Pinochet’s fear-mongering and heavy-handed coercion. But, at the same time, he was also aware that “like attracts like,” realizing that, if he fashioned a campaign to attack those harsh government tactics, it would only serve to birth more of the same, both in the minds of voters and perhaps even in the streets of the nation’s cities. To counter this problem, René devised an approach that would give voters what they wanted but without any unwanted consequences: Rather than focusing the campaign on what citizens didn’t want, he instead chose to focus it on what they did. He knew that Chileans craved a bright, hopeful future, so he structured the campaign to reflect that desire. Placing emphasis on what’s being sought, rather than on what’s to be avoided, significantly bolsters one’s efforts to attain the goal in question (think “love peace” and not “hate war,” and you’ll get the idea here). With the hoped-for outcome thus identified, René and his associates nurtured the concept in the minds of voters through repetition and reinforcement. As citizens grew ever more enamored with the idea, they became empowered by it, forming beliefs to support it, and then to manifest it, en masse. And, the longer this went on, the more confident they became in their conviction that this radical “No”-tion could, in fact, become a reality. To be sure, some of René’s tactics were a little goofy, but they nevertheless generated the support his effort needed, a particularly important consideration for an undertaking as big as this. A mass co-creation requires ample input from all involved to make it happen; the more backing that can be created for it, the greater the likelihood of success. Using a fresh, novel approach can often go a long way toward furthering such an effort, too (as anyone who has ever explored a sound but untried probability can attest), and René’s strategy indeed qualified on that front as well. Of course, it goes without saying that the idea never would have sprouted legs had it not been for the steadfast resolve of its co-creators with regard to the beliefs driving its materialization. Besides holding firm to their convictions, the co-creators behind this program also managed to fend off the onslaught of attacks put forth by the Yes campaign’s naysayers, who routinely mocked (and later attempted to bully) their counterparts. However, the proponents of that initiative failed to realize just how out of touch they were with the beliefs of the majority of the Chilean population, so not only did their own efforts flop, but so, too, did their assaults on the opposition. Indeed, as this picture clearly shows, the power of ideas is something not to be messed with. “No” is a strangely captivating film, very different from what one might expect out of a movie with a primarily political narrative, yet this witty, sometimes-campy, sometimes-cynical, occasionally dark comedy is a refreshing change of pace. Its subject matter is reminiscent of the intensely dramatic works of political filmmaker Konstantinos Costa-Gavras, peppered with the off-beat humor of directors like Bill Forsyth or Michael Ritchie. As unusual as this fusion is, though, it works amazingly well, thanks in large part to its well-written script (adapted from an unpublished stage play by Chilean author Antonio Skármeta) and the skillful direction of filmmaker Pablo Larraín. The pacing in the first 30 minutes is, admittedly, a little slow, mainly due to some dry, overly talky dialogue, but the crisp flow of the story line picks up thereafter, when the protagonists launch into the heart of the campaign, helping the movie overcome its somewhat sluggish start. The picture also features some intriguing camera work, intentionally filmed using vintage video technology to seamlessly blend the movie’s live action sequences with archival footage from 1980s Chilean TV, making the two look virtually indistinguishable. Some of the movie’s cinema verité work can be a little annoying at times, but this doesn’t detract much from the overall clever nature of the cinematography. The picture’s soundtrack doesn’t always work either, but the inane campaign music incorporated in the film is a certified hoot. 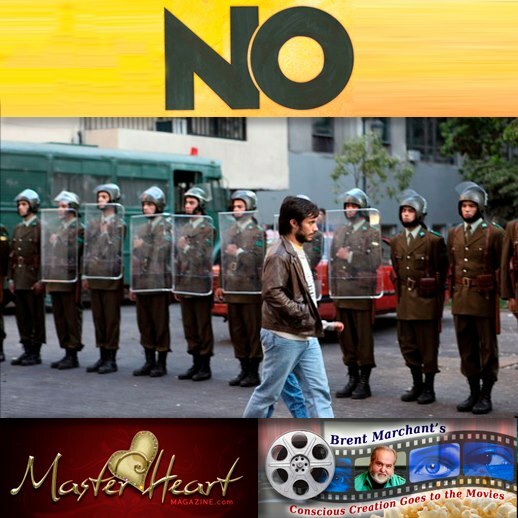 “No” received its share of attention during the 2012 awards season, having earned an Oscar nomination for best foreign language film. It also received the C.I.C.A.E. Award from the International Confederation of Art Cinemas at last year’s Cannes Film Festival. The picture is currently playing in limited release, primarily at theatres featuring foreign and independent cinema, and is scheduled for DVD release in late June. It’s been said that “the pen is mightier than the sword,” mainly because the former is the means for conveying ideas, those formidable weapons that trump the effects of whatever tangible arms one might deploy in combat, a lesson the Chilean government learned the hard way in its bid to maintain power. Indeed, when an idea’s time has come, there’s little to restrain it, especially when propelled by the beliefs of the masses who fervently get behind it. To that end, then, “No” should serve as a cautionary tale to anyone who would attempt to thwart the will of those who would seek to bring such notions into being. If you doubt that, just ask Augusto Pinochet. Photo by Tomás Dittburn, courtesy of Sony Pictures Classics.